Obviously I’m obsessed with Pumpkin Spice All The Things right now…but you’re okay with that, right? 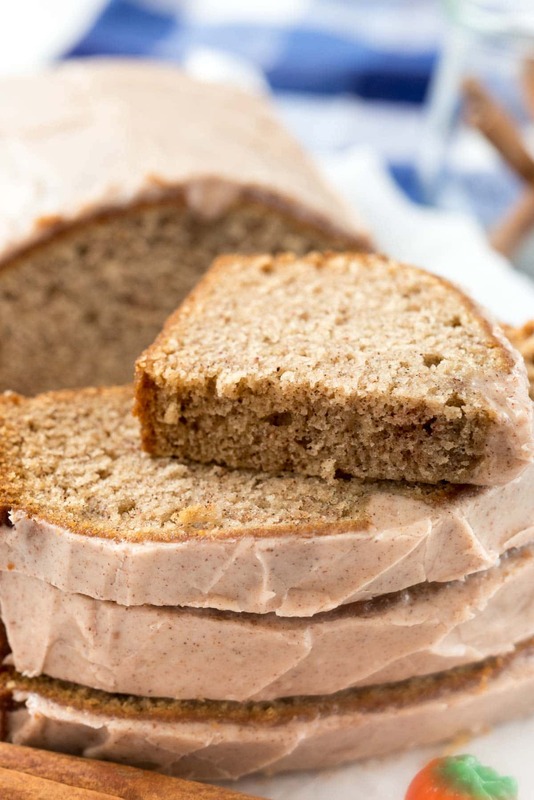 This Pumpkin Spice Banana Bread will satisfy your cravings too! Before we talk about how perfect this Pumpkin Spice Banana Bread is for fall, I have an announcement. 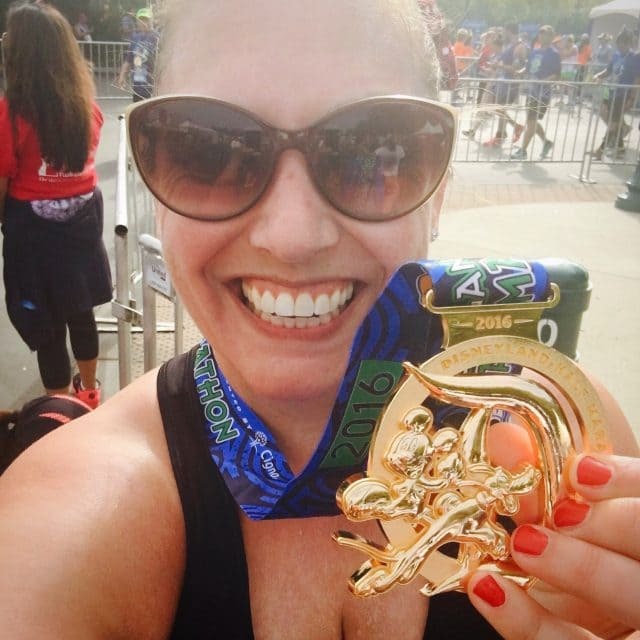 I RAN A HALF MARATHON. And I finished it! I didn’t think I could make it and I was so nervous. Then I started and it all just kind of went perfect. I ran more than I normally do and finished in less time than I thought I would. More than the actual finish, just DOING the whole thing has made me so proud of myself. All my life I’ve said I’m not athletic, I’m not a runner, I could never run a 10k let alone a half marathon. I’ve spent the last 6 months proving that wrong: I may not like running but I AM a runner. And I CAN do anything I set my mind to. Let this inspire you to do something that you think you can’t do but have always wanted to. What is your goal? Go for it- you can do it. And it’ll feel so good when you accomplish something you never thought you could do. I also never thought I could make my mom’s banana bread better…but I did. I added pumpkin spices and a pumpkin spice glaze to the top. Add this to your fall bucket list, people, you won’t be sorry. I started this recipe with my mom’s banana bread. Have you tried that recipe yet? It gets a gorgeous crack right down the center that’s perfect EVERY time. I know, why mess with an original? Because I’m me, that’s why. I had to FALLIFIZE my mom’s banana bread recipe. Yes, fallifize – I created a word. It means “to make everything into something that fits with fall”. LIKE PUMPKIN SPICE. 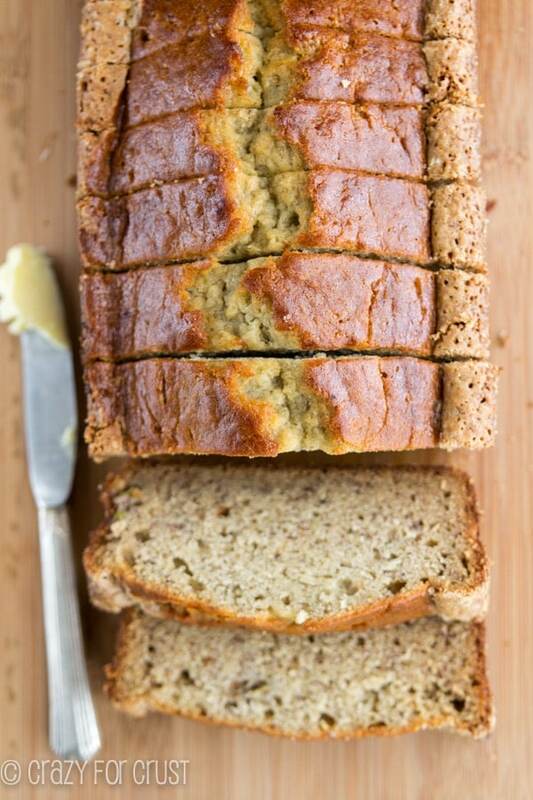 I added a hefty dose of my favorite spice to the banana bread recipe itself AND to the glaze. I’m sorry, but I now think every bread should have a glaze. 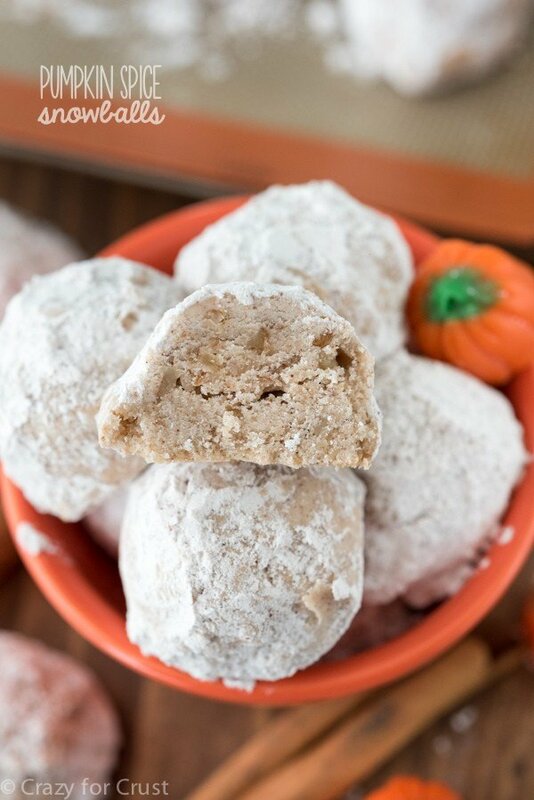 It’s a powdered sugar glaze made with heavy whipping cream (a MUST) and the spices. You pour it all over the top of the bread and then you lick the bowl clean. I made a few other easy changes to the recipe too: I reduced the sugar to compensate for the glaze and I used oil instead of butter. Sometimes I just want to stir by hand and not use a hand mixer. Is anyone with me? The result? 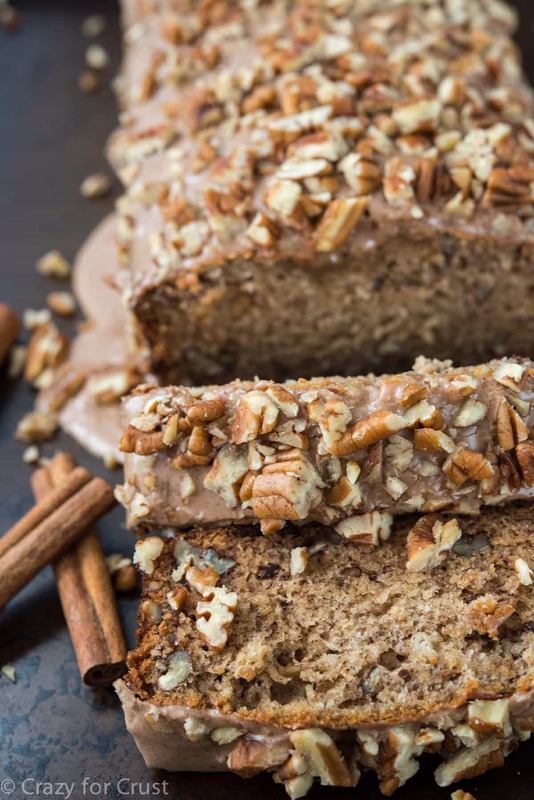 A fluffy and indulgent sweet and fall spiced banana bread. This one’s a keeper, yo’. Add bananas, eggs, milk, vinegar, vanilla, baking soda, and pumpkin pie spice to a blender jar and blend until smooth. Pour half the banana mixture into the oil mixture with 1 cup of flour. Stir until just incorporated, then add the remaining banana mixture and flour. Stir until just incorporated. Pour into prepared pan. To make the frosting: whisk powdered sugar, pumpkin pie spice, and salt in a medium bowl. Whisk in vanilla and 1 tablespoon heavy whipping cream, adding more cream as needed for consistency (up to 2 tablespoons). 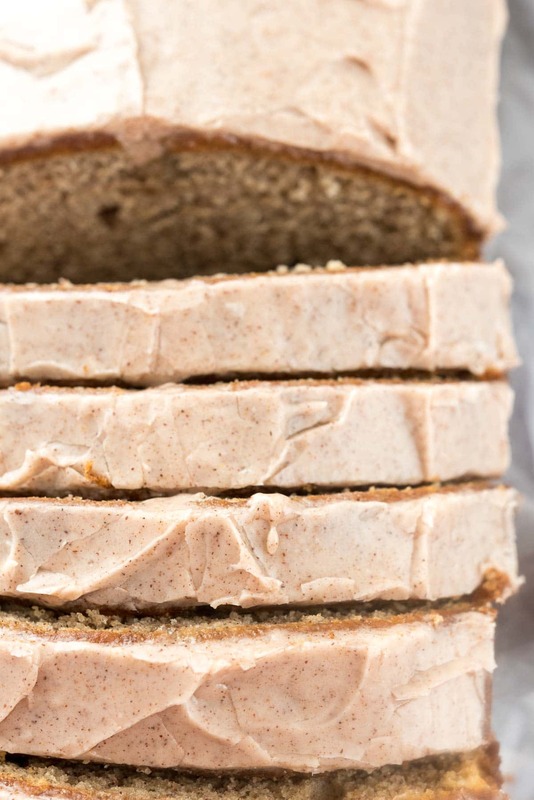 Frost banana bread. Chill to set. Store in an airtight container for up to 3 days or slice and freeze for up to 1 month. When does the flour get added in. I see 2C of flour in the recipe, but the instructions do not say when to add it. I’m already making this, so I’m going to hope and assume that it’s during the blending process with the bananas and eggs. Crossing my fingers that I’m correct and that it still turns out yummy!! I have an 8×4 pan, will that be too small? Could I split between two 8×4 pans and adjust the baking time? The glaze sounds delicious but I might swap for chocolate chips in the bread. Excited to finally try this out!